Two leading organisations have moved to Lothbury Investment Management’s Broadland Business Park in Norwich. Persimmon Homes Anglia, the region’s biggest house builder, moved into its own new home at Bankside 100 in June. Staff have transferred to the purpose-built headquarters from their previous offices near Lowestoft, where the company has been based since the 1970s. Long-serving employee Gillian Keiley, who has worked for Persimmon for 25 years, performed the ribbon-cutting ceremony to officially open the new purpose-built building. Up to 50 staff will be based at the three-storey, 9,000 sq ft office. 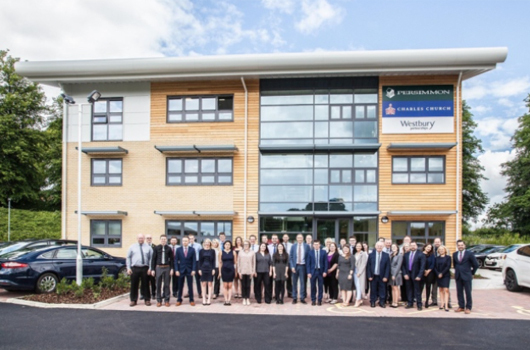 Meanwhile, the UK’s largest housing association, Clarion Housing Group, has also moved into its new office in Reed House on Broadland Business Park. 450 staff previously located in three offices at St Andrews Business Park in Norwich have now been brought together under one roof with the move. The offices have capacity for up to 600 staff. Clarion owns and manages 123,000 homes across the country and was formed from the 2016 merger between Circle Housing and Affinity Sutton. Staff at Reed House will provide functions including housing management, finance, human resources, IT and marketing. More information on Broadland Business Park is at www.broadlandbusinesspark.co.uk.